We are not the first people to tell this story. It does not make for easy reading. But it is a story that needs to be retold as a reminder of the depths that humanity can sink to, then and in today’s conflicts. When will we ever learn from the past? 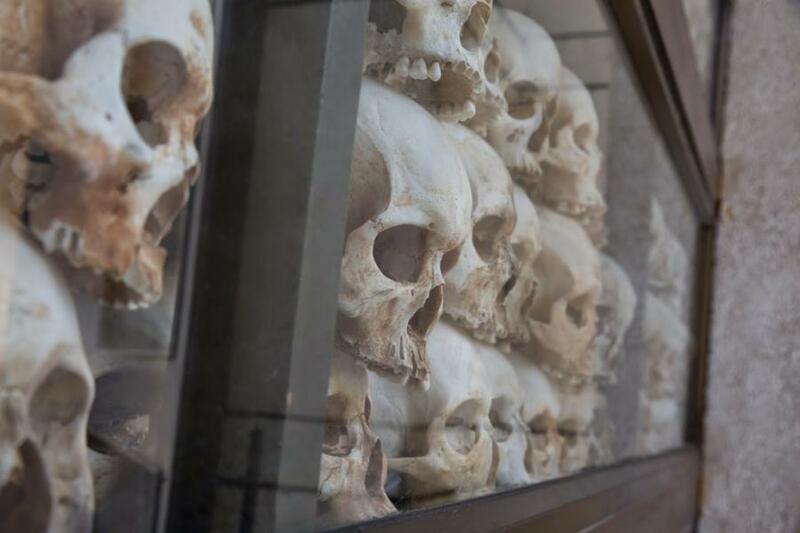 After taking power in Cambodia in 1975, in 4 years of power, the Khmer Rouge achieved a record of barbarism rarely equaled in history, being responsible for one of the worst mass killings of the 20th Century. This brutal regime claimed the lives of up to a 2 million people – a quarter of the total population of Cambodia. Under the Marxist leader Pol Pot, the Khmer Rouge quickly set about transforming Cambodia into what they hoped would be an agrarian utopia ,taking Cambodia back to the Middle Ages , with peasants working by hand in the fields and all modern aspects of life outlawed. 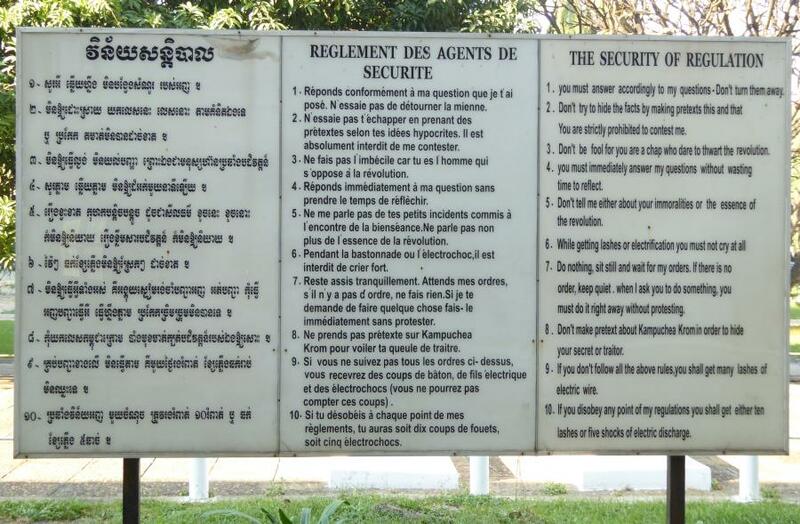 Pol Pot envisioned a Cambodia absent of any social institutions such as banks, religions or schools. He sought to triple agricultural production in a year. 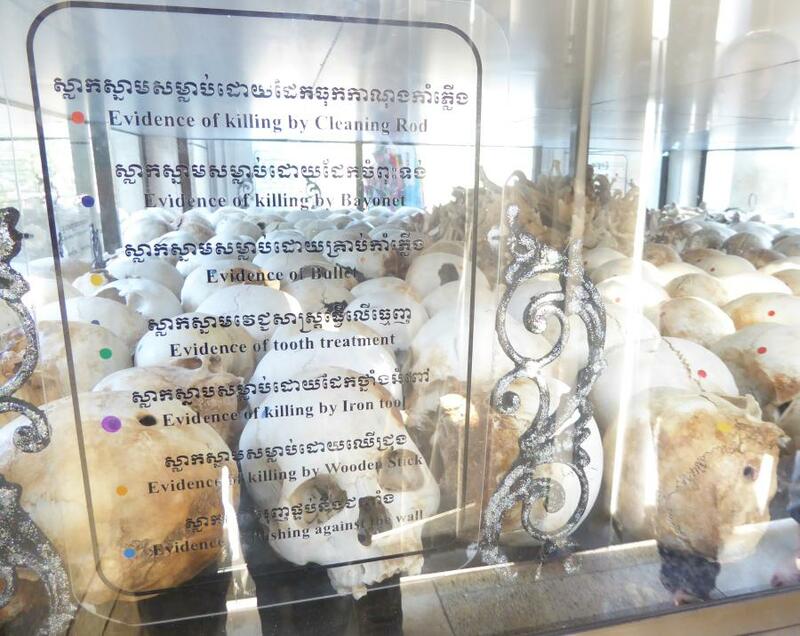 “What is rotten must be removed,” read a popular Khmer Rouge slogan at the time, and remove they did, often by execution but sometimes simply by working people to death in the fields. Dissidents were eliminated. ‘To keep you is no benefit – to destroy you no loss,’ was Pot’s favored mantra. Hundreds of thousands of the educated middle-classes were tortured or executed in special re-education centers. 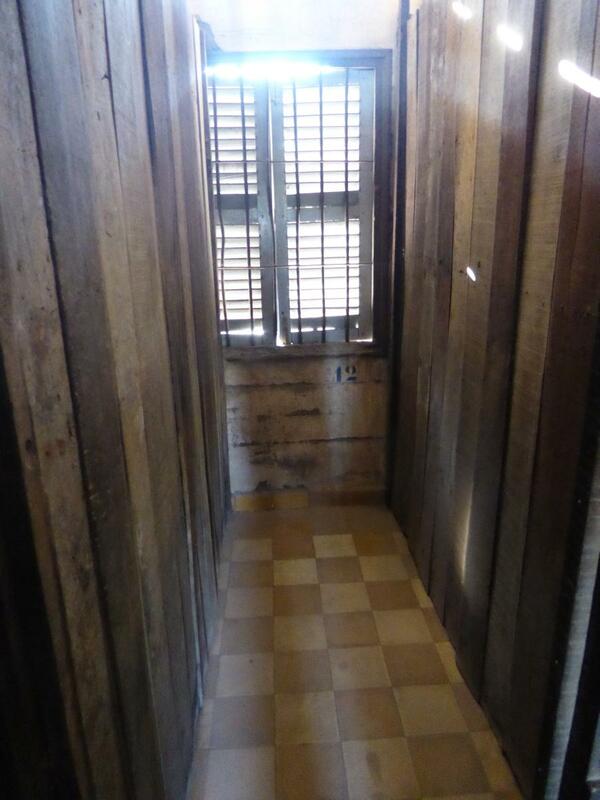 We visited the most notorious of these centres – S-21 jail, also known as Tuol Sleng, in Phnom Penh. It has been kept exactly as it was in 1979 as a sober reminder. As many as 17,000 men, women and children were imprisoned and killed at S-21 during the regime’s four years in power . No one was spared -Doctors, teachers , students , Buddhist monks, soldiers from all ranks ,whole families. 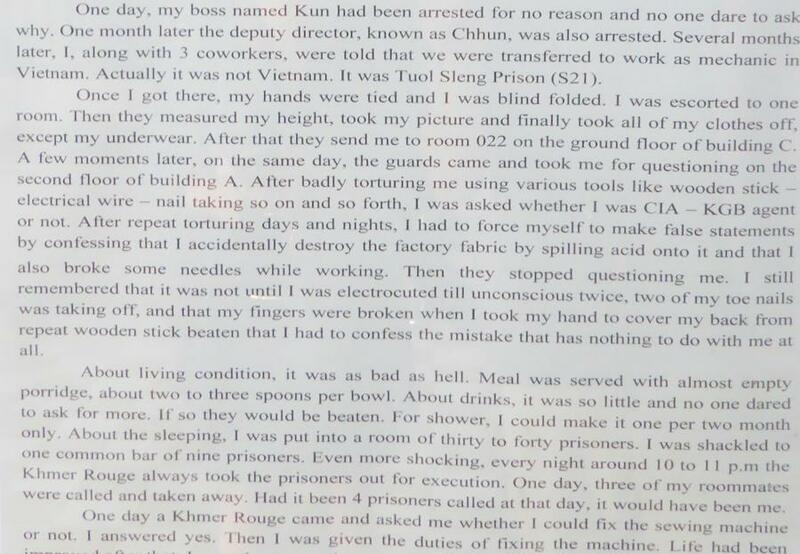 Methods of torture were horrific. 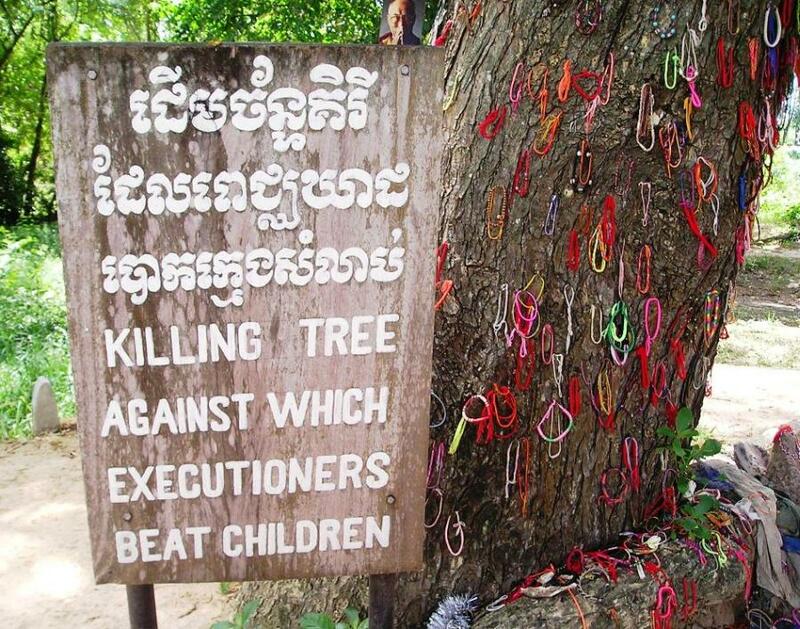 At these re-education centers some children were brainwashed into becoming Khmer Rouge soldiers. They were taught to hate their parents and many of the child soldiers’ first victims were their own parents. 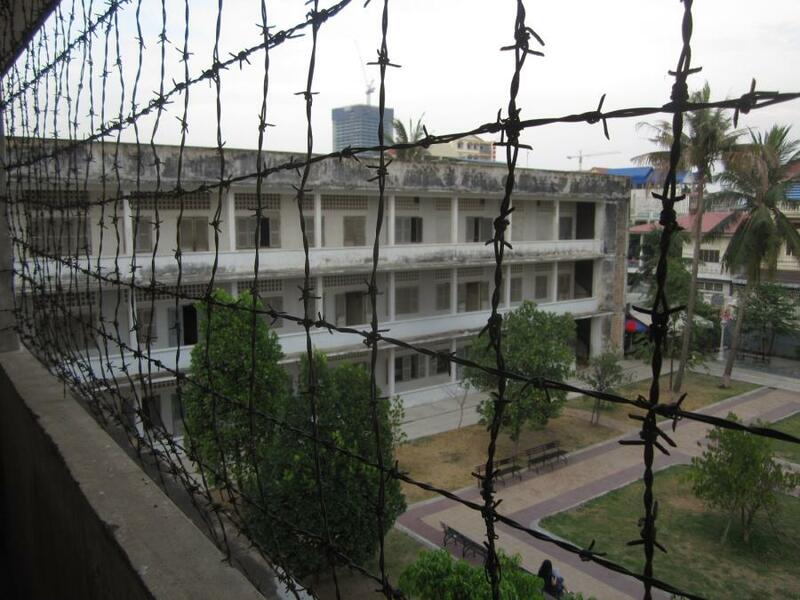 S21 was converted from a school to a prison . These partitioned cells each housed 30-40 prisoners who were unable to lie down due to so many being cramped into one unit. Sleeping was taken in turns. 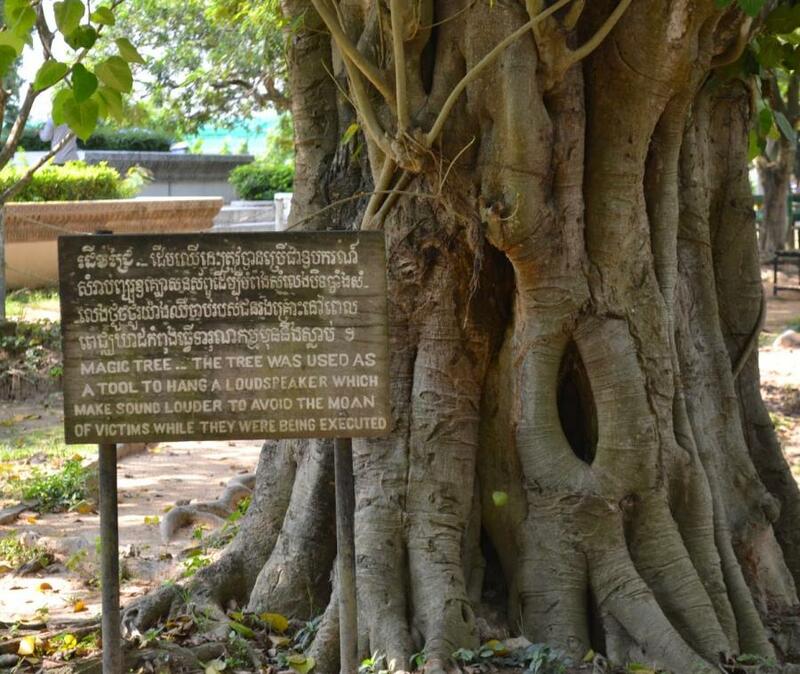 The Khmer Rouge’s brutality spread into every corner of Cambodia, resulting in the infamous title of the Killing Fields . So far 343 killing fields have been uncovered to date. We visited the Choeung Ek Genocidal center , a memorial to one killing field where 20,000 people were buried in one mass grave by the KR. It is disturbing and moving to stand on top of a mass grave, comprising thousands of bodies. Every time it rains, bones and teeth fragments surface from this site. Khmer Rouge leaders had a manic hatred for the Vietnamese and expended considerable effort in trying to whip up anti-Vietnamese sentiment. Claiming Southern Vietnam as their territory, the Khmer Rouge launched numerous cross-border raids, burning down villages and massacring their inhabitants. In all, around 30,000 Vietnamese civilians lost their lives in the attacks. The Khmer Rouge government was finally overthrown in 1979 by invading Vietnamese troops, with the higher echelons of the party retreating to remote areas of the country. With the withdrawal of the US from Vietnam still a fresh memory, the Carter Administration urged international aid organizations to cut off assistance to Vietnam for having overthrown the Khmer Rouge & Pol Pot . In 1979 the United States and China wielded their influence and pushed through a vote in the UN General Assembly in favor of granting Cambodia’s UN seat to the ousted Khmer Rouge regime, and terminated a UN investigation into Khmer Rouge crimes. The following year, the United States again supported the Khmer Rouge in the UN as the “legitimate” representative of the Cambodian people. 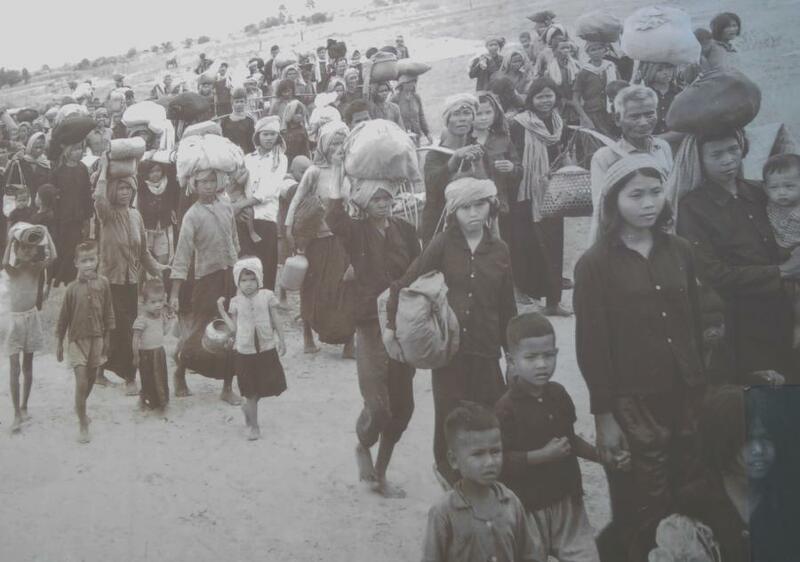 With U.S. backing, Cambodia would continue to be represented in the United Nations by a Khmer Rouge diplomat until 1993. 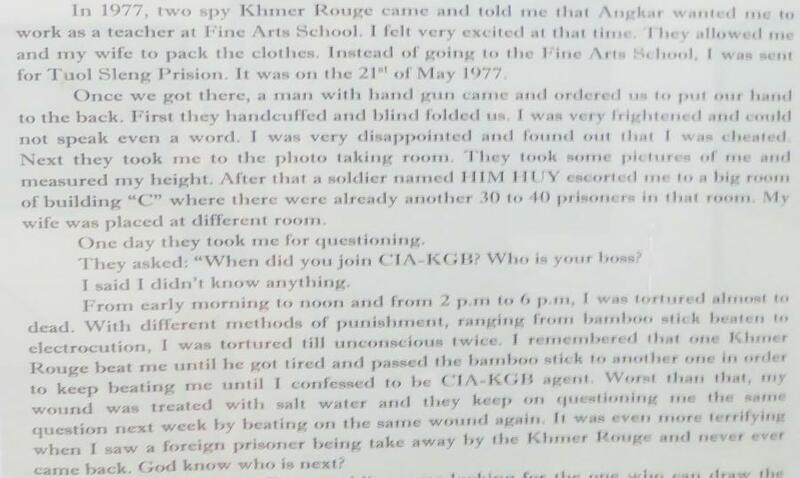 Pol Pot continued to lead the Khmer Rouge as an insurgent movement until 1997, when he was arrested and sentenced to house arrest, after killing one of his closest advisers. He died in 1998 in a tiny jungle village, never having faced charges and denying the millions of people who were affected the chance to bring him to justice. Survivors told their stories to shocked audiences. In the 1980s a film ” The Killing Fields” brought the plight of the Khmer Rouge victims to worldwide attention. Yet to-date only a handful of KR perpetrators have been tried in a court of law. History is more than just studying past problems for present day solutions. Each detail is the representation of an individual human beings experience. 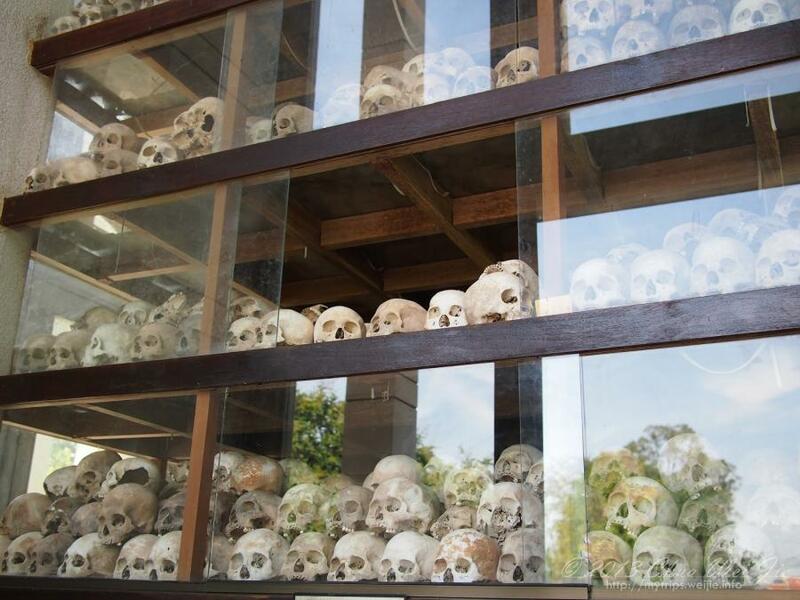 The people who suffered under the Khmer Rouge deserve to be remembered and honoured. Thanks for your insightful posts which go beyond the mumdane. Man’s inhumanity to man comes to mind——–quite horrific ! Oh to rub it out and start again !! Thanks for your very shocking but real story ! Worse than the Nazi and Hitler and yet so few people are aware of this, me included. Thanks for enlightening us.